The Recreation Pier in historic Fell’s Point, Maryland is located within the 1700 Block of Thames Street, and was originally built in 1914 as a commercial pier. It also had recreation facilities, including a ballroom that served for decades as a meeting place for young people from the Point's many ethnic groups. 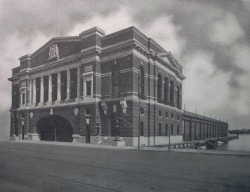 The recreation Pier served as a landing point for thousands of new immigrants processed across the river at the Locust Point immigration station. The Baltimore Harbor Endowment has commemorated these pioneers and their descendants with 10,000 engraved bricks on the pier adjacent to the Rec Pier. The ferry continued to serve as an important social and economic link between the Fells Point and Locust Point communities until it finally closed down in 1937. From 1993-1999, the Pier had been featured as the police headquarters for NBC’s network television series, Homicide: Life on the Street. Founded in 1730 by William Fell, The Fell's Point Historic District is outlined by Aliceanna Street on the north, Wolfe Street on the east, Dallas Street on the west, and Baltimore Harbor on the south. In 1763, William's son Edward Fell laid out streets and began selling plots. The town grew quickly, and eventually incorporated with Baltimore Town and Jones Town in 1797 to form the City of Baltimore. The area grew wealthy on the tobacco, flour, and coffee trades through the 18th and 19th centuries. Some of the first vessels commissioned for the US Navy were built in Fell's Point yards and the area became best known for topsail schooners, sometimes erroneously called Baltimore clippers, renowned for their great speed and handling. With a lively port and plentiful employment, the neighborhood served as home for many immigrants. After the Civil War, into the turn of the century, as the shipping and shipbuilding industries moved to larger facilities, the neighborhood fell into decline until preservationists organized to save the historic buildings and cobblestoned streets. Today, the historic Fell's Point community caters to an increasing number of middle to upper middle class residents and boasts the greatest concentration of bars and restaurants in the city. Fells Point Historic District National Register #69000319 (1969).